This is a large size tin with a screw on lid larger than most for a shaving cream. The opening is more than antiquate to load any size brush from. It’s a heavier gauge tin so it has some durability to it. The waterproof label on the lid states the company logo on top along with the product name and scent right underneath. On the bottom label, we have the product information including the scent description, application instructions, website, and ingredients. Once you open the tin you are hit by the Vanilla bean, Almond and sweet cherry scent that is in a word amazing. Elvado calls themselves the fragrance people and they live up to that claim with this product. This creams texture is much denser than others I’ve used in the past in fact if you flip the tin upside-down gravity has no effect the cream stays put. I did a face lather and loaded my brush with ease but because its so dense this soap lacks water which you must add back once you start applying and when you do you’ll start to get a rich creamy lather with the most amazing slickness and glide. This is so good that even after your shave you can still feel the slickness on your face. I also found the cushion to be more than ample as well. As a bonus, you also get a boost in scent but sadly this does not linger long after the shave is over. There are some key features that stand out with this cream which is the African Shea Butter & Avocado Oils that are used these ingredients seem to really help this one come to the top of the pack. 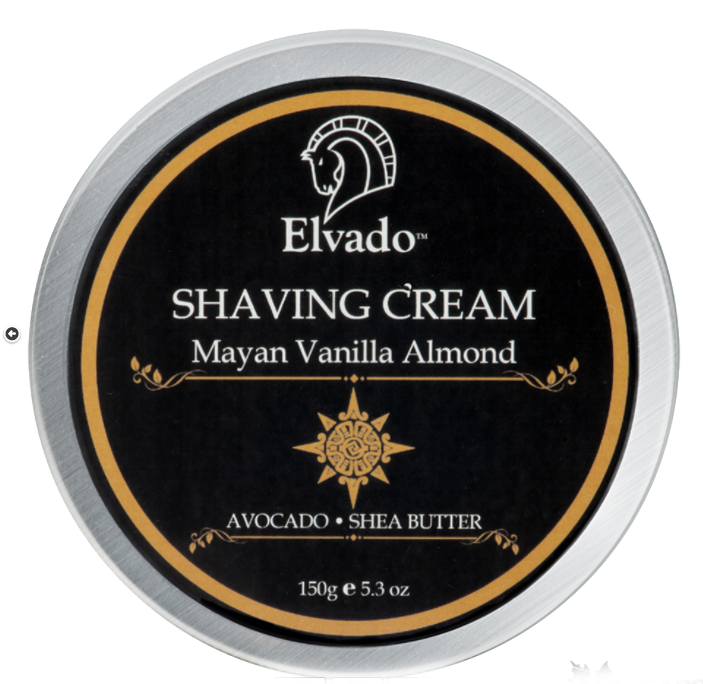 So, I had a great shave with Elvado and I think you will too. They certainly have created a natural alternative to products in today’s marketplace but with anything called “Natural” today you’re going to have to pay more for it and that holds true to Elvado products as well. They don’t sell products directly so you have to look for a featured retailer from the website close to your location. I did notice Maggard Razors as is one of them and as of this writing, I see only 3 tins left of Mayan Vanilla Almond is stock.